Tony Takitani is a film adaptation of Haruki Murakami's short story. Directed by Jun Ichikawa, the film deals with the themes of obsession, isolation, loss, and loneliness. Ichikawa's quirky, minimalist approach has effectively translating Murakami's style to the big screen. The film is deliberate and sophisticated in its stylistic endeavours. The colour palette is extremely sombre with greys and greens favoured. The psychological void experienced by the characters are backed with Ryuchi Sakamoto’s elegiac piano chords. Characters sometimes take the words of the ever present narrator to add more life to it. Attention to detail is flawless and the film’s downbeat, lonely sensibility infuses every scene. Tony Takitani celebrates love, yet love is shown also to be something that can be debilitating, even destructive, especially when one is separated from the object of his or her affection. The metaphor of Eiko's obsession and love for her clothes cause her death and Tony's love for deceased Eiko is so debilitating that the presence of her clothes evokes painful memories that seem to haunt him for the longest time. So haunting is Tony Takitani, that once you've seen it, the memory of it will stay with you, whether you like it or not. 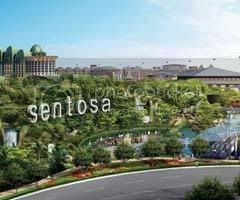 For those of you who have been in touch with news back in Singapore, you must have heard of the recent bid on the Sentosa Integrated Resort project. It was with no surprise that Genting International-Star Cruises consortium won the project yesterday, with its leverage on international brands such as Universal Studios and other attractions such as three other water-themed attractions, including the world’s largest oceanarium. 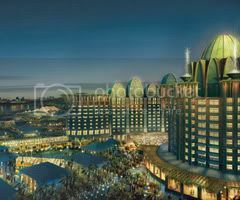 Genting’s proposal also includes six hotels with over 1,800 rooms for both leisure and business travellers. 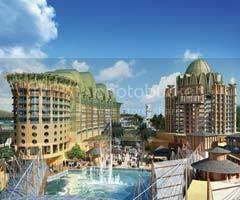 The resort is expected to attract 10 million visitors and generate SGD$15 billion in tourism receipts by 2015. The project is expected to be ready in 2010. Let's get it straight. Two pieces of big rubbish, two pieces of little rubbish, and one piece of big gem. Sitting at the centre of the ground floor gallery of the newly opened White Cube Mason's Yard is a big cage-like globe made of black stainless steel with vermilion-coloured neon tracing the shape of continents and islands (Hot Spot). I don't get excited. The globe, surrounded by red-coloured walls, is tilted, just like the real earth, with Europe at the top. Eurocentrism? The artist uses more than one neon tube to trace the costal lines. I would be impressed if a single neon tube outlined the world map, indicating the unity of the world though careful attention is required to realize it. On the wall of the gallery hangs a small world map made of cotton (Projection). I'm offended by the fact that Japan is one island on this map. (If you don't know, Japan consists of four main islands.) Going downstairs does not help me feel better. A large black cage sits on a white cube gallery (Cube). I can see something like this in a park: a playground equipment known as the jungle gym. When I look on the wall, four little maps show the airline routes in the United States, the UK, Europe, and Spain (Routes IV). The artist fills triangles created by airline routes to create a geometric pattern on the map. Well, children can come up with this idea, can't they? Also, why not Asia or Africa? The Democratic Republic of Congo would be very interesting. Don't you know this country has developed a good airline transport system though it has terrible road and railway networks? A good art work wouldn't allow a viewer to say, "I could have done this in a better way." The four consecutive disappointments lead me to the final gallery, a very spacious white cube. Hanging from the ceiling and stretching over the entire space is a cobweb after the rain (Web). The center of the web is at the height of your waist. It's just beautiful. No unnecessary decorations. It perfectly matches the whole concept of White Cube. Gazing at raindrops on the web randomly reflecting six white lights on the ceiling somehow calms down my mind which has always been messy recently. I realize there is one common theme penetrating all the three big works: you can look into the other side with awareness of this side. That's what a cage and a web allow you to do. But the message the artist wants to convey by that theme unfortunately fails to reach me.